The glare from the sun can have effect your vision and making it difficult to see limiting performance while play sports like golf and making it dangerous to drive. Polarized lenses eliminates this glare, if you have trouble seeing due to glare, ask your eye care professional about polarized lenses. Skin protection from the sun is a fast-growing concern for everyone who spends time outdoors, but you may be unaware that the sun’s UV rays can also contribute to the development of several serious eye conditions. Now you can protect your eyes without sacrificing vision quality. The PrescripSun™ lens series provides you with high performance prescription sun lenses in both fashion and sports frames for any style or activity. 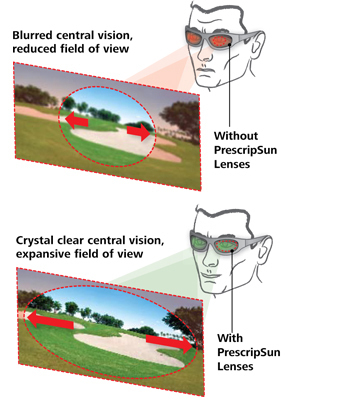 Ask us about PrescripSun lenses and how they can help you protect your eyes and perform at your peak every day!